Perhaps the most important aspect of golfing is knowing the distance to the target. This is where rangefinders come in handy since they measure that distance. There are two types of models – laser and GPS. Golf laser rangefinders determine distance by projecting a laser beam that travels from the unit to the target and back, then calculates how long it took. Golf GPS rangefinders calculate the distance to the target through GPS satellite signals just like your car uses. Laser models are more accurate, but also more expensive. GPS units also rely on pre-loaded course information, without that it would be useless. Some features you should look for when buying a new golf rangefinder include accuracy and range, size, ease of use, warranty, and pinseeker or prism technology which helps you target the flag. You should also be aware of slope versions which calculate distance by factoring in the slope angle, but these models are not legal for tournament play. Below you can read our reviews of the best golf rangefinders. We chose the $390 Bushnell Pro X7 as the best golf rangefinder. It has the most range and best accuracy of any golf laser rangefinder. The range extends to a full 1760 yards, with 550 yard range to the flag and the Pro X7 has an accuracy of 1/2 yard when over 125 yards and within 0.1 yards inside of 125 yards. The vivid display technology helps with varying light condition and combined with 7x magnification lets you see easily in any situation. The X7 has pinseeker technology with JOLT which vibrates when you lock onto a flag so you know you reading the flag and not a tree in the background. It is also waterproof and super simple to use. The Pro X7 is tournament legal since it does not have a slope function, however if you want slope capability then you can buy the Bushnell Pro X7 Slope with JOLT model for about $500. We recommend the Bushnell Pro X7 for all golfers because it is the industry leader in almost every category, however there are cheaper units available if cost is a concern or for more casual golfers. The best value for the money golf rangefinder is the $234 Bushnell Tour V4. It is smaller than the V7 and while the range is shorter, the V4 is still really effective. It has a range of up to 1000 yards or 400 yards to the flag. It is accurate to +/- 1 yard. The 5x magnification is a bit weaker than most other models that have either 6x or 7x. The Bushnell Tour V4 makes target acquisition easy with its pinseeker technology and fast focus system. The JOLT technology will vibrate the device when you have locked on the flag. This version does not contain a slope function which makes it tournament legal, however if you want a version with slope you can buy the Bushnell Tour V4 Slope with JOLT for about $307. Overall it is an affordable, high quality golf laser rangefinder that is compact enough to fit in your pocket and we would recommend for all types of golfers. The most expensive rangefinder on our list is the $430 Leupold GX-4i2. It has a unique feature in that it comes with two faceplates – yellow and silver – that allow you to switch between tournament legal mode and slope mode. In addition to slope, after imputing a few figures it also can take into account the temperature and altitude to adjust yardage and then recommend which club to use. The Leupold GX-4i2 laser rangefinder has a range of up to 700 yards and is accurate within 0.5 yards. It has 6x magnification, pinseeking technology, is waterproof, and comes with a 2 year warranty. One negative of the GX-4i2 that some users have complained about is that it is sometimes hard to hold steady enough to get a reading. A relative newcomer to the golf world receives our recommendation for the best cheap golf rangefinder and is also currently the best selling rangefinder on Amazon. The TecTecTec VPRO500 sells for just $150, but boasts 6x magnification, 540 yard range that is accurate to +/- 1 yard, and decent pinseeking technology. It is also small enough to fit in your pocket and is water resistant. The TecTecTec VPRO500 is tournament legal, but there is a model with slope functionality – the VPRO500S which sells for about $206. The main downside is that it is not quite up to par with Bushnell and Leupold models in accuracy and capability, but it is significantly cheaper and thus makes a great choice for occasional golfers. TecTecTec also offers a 1 year warranty for those of you concerned with durability. At just 4.4 ounces and with dimensions of 3.6″ x 2.9″ x 1.5″, the most compact and lightweight golf rangefinder on our list is the $162 Nikon Coolshot 20. With a range of 550 yards and accuracy within 1 yard, it can get the job done. It also has 6x magnification with clear optics and 8-second continuous scanning that will continuously give distances for 8 seconds no matter what you point at. While it does not have true pinseeker technology, it instead uses what Nikon calls First Target Priority Mode which is designed to give you the distance of the closest object amongst multiple objects like a flag in front of trees. The Coolshot 20 does not have a slope function, so it is tourney legal. Some players said it can have a difficult time picking a flag out over about 200 yards. 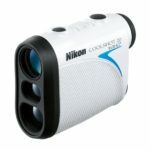 Other than that there are not really any major complaints, so the Nikon Coolshot 20 is another solid choice for a budget golf laser rangefinder. Breaking 80 Golf makes a few different rangefinders that seem to go into and out of production occasionally. Their top model – the Breaking 80 Golf IS800 makes our list and sells for about $185. It has a range of 800 yards and accuracy of within 1 yard, pinseeker technology, and 6x magnification. This version does not contain slope and is therefore tournament legal. The Breaking 80 Golf IS800 is not as well built as the Bushnell or Leupold models and not as accurate either. However, it is an option for those golfers seeking a cheap laser rangefinder. If you are looking for a hybrid laser/GPS golf rangefinder then the Callaway Hybrid GPS might be for you. 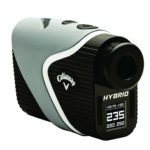 Selling for about $332 the Hybrid GPS combines both a laser rangefinder with GPS technology to gauge distance – even on blind shots. The laser portion runs on a separate CR2 battery with a range of 1000 yards (300 yards to pin), accuracy to within 1 yard, 6x magnification, and pin acquisition technology. The GPS portion runs on a mini USB rechargeable battery and comes pre-loaded with 30,000 golf courses which can be updated for free online. It has 4 buttons and a LCD display under the laser scope which shows you the distances to green and layup/carry distances to hazards and doglegs. Negatives that a few people have noted include trouble detecting flags and sometimes the GPS and laser measurements differ which can make it difficult to get the true distance, although they are typically within just a few yards. The hybrid model is not quite perfected here, but the Callaway Hybrid GPS is the best hybrid laser/GPS golf rangefinder to make our list. 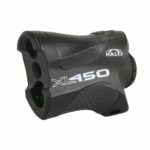 Although not specifically built for golf, the Halo XL450 rangefinder is the cheapest model on our list and the only rangefinder under $100. Selling for just $88 the XL450 is cheap, yet still functions pretty decent with a range of up to 450 yards and accuracy of +/- 1 yard. It has 6x magnification and works well on reflective markers, but does not have specific pinseeker technology which makes it difficult to spot flagsticks that do not have reflectors. The Halo XL450 does have AI built-in that accounts for slope, so it is not tournament legal. Its main weaknesses are poor visibility in low light, low accuracy over 200 yards, and false readings when trying to distinguish between multiple objects. If you want to buy the Halo XL450 rangefinder keep in mind that you get what you pay for, and at under $100 the quality is not up to par with more expensive units.